Chris Wekesa was the only Kogalo player to see playing time as Kenya went down 1-2 to visiting South African national team. Wekesa also earned the ignominy of gifting the game to Bafana Bafana when he headed the ball innto his owne net in a bid to clear a cross. Jerim Onyango was on the bench. Wekesa was making a return to the national team after almost 2 years. He last played during the 2010 CECAFA cup. Harambee stars got mixed reviews. They dominated possession but with a packed South African defence, they found it difficult to score. The South Africans had taken a 17th minute goal whenTokelo Rantie latched onto a through ball to beat Arnold Origi in the Kenyan goal. Dennis Oliech leveled the score on 72 minutes from the penalty spot. The penalty was awarded after a South African defender handled a header from Wesley Kemboi. But before Kenyan fans finished celebrating, Wekesa headed the ball into his own net from a Bernard Parker cross. Most fans in the blogosphere were incredulous when Kemboi aka “Steeplechase” was selected ahead of Rama Salim and even Belgium based Ayub Masika who spent most of his time on the bench. But Kemboi earned his spot as did debutant Francis Kahata who finally seems to be fulfilling the hype that he came with when he first appeared on the scene 4 years ago. The team that played Angola in Luanda and Uganda in Kampala last year was more superior tactically, defensively and even in as far as entertaining football is concerned. Watching Kenya play yesterday, left me with so many questions than answers. Even Efusi does not play that kind of dull, disjointed football. 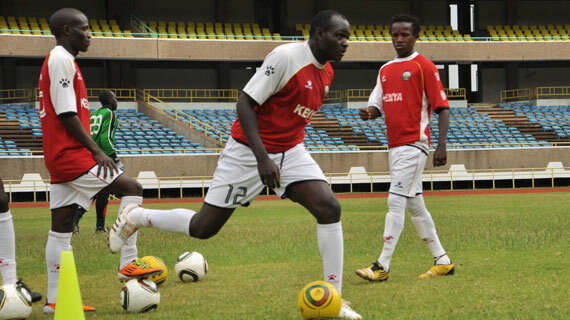 Why did Nyamweya fire Zico? I think the coach needs to maintain the original defense since for the past two years Kenya has never had any problem with defense. Now what Michel needed to do as his starting point is the striking force and midfield. Wekesa really played well but they could not gell well at the back and he ended up watering all the effort he had done by an own goal. In fact if not that S.Africa went defensive they could have beaten us 4 nil. Again the writer is misleading by telling us that AFC players did not feature, not even in the bench – what about Okwemba and Wafula? I thought I saw both playing in the second half? AT 1 AND 2 THIS THING IS NOT ALL ABOUT GOR AN AFC…..ITS ALL ABOUT NATIONAL TEAM…..
i thnk this article is REALLY PATHETIC. are players select into harambee stars on quarter basis. is there a ranking btwn kemboi and rama, that rama should be given first priority before kemboi. i thnk such ‘technical advisers’ are the kind of ppl who really mess kenyan soccer. with u as a coach i can almost imagine half the line would have been gor players(the same team that kud not beat muhoroni!). pls not the reason why ppl like logar and michel are being brought into the country is coz they are independent of ur kind of thnking. choose players in the national team who deserve to be called. take note that gor is a big name at the moment but in terms of football standards we are low, this is what is being built so fronting that gor players be included in the national team just coz it’s gor is lame and very myopic of ppl like you. why are you judging the coach with one match and on the other side arguing on the same blog that logar needs time. it is high time gor and afc fans should stop counting how many of there tribesmen are on the stars line-up. it’s so disgusting that this is all what bloggers (admin included) can talk about. so wether ur tribesmen were playing or they were in the bench or taking a shower, kenya still lost. the thng is to let the coach do his job! pls note that these names you keep floating around, rama, wafula, okwemba are currently engaged in one of the lowest ranked leagues in africa, kenya is currently n0:129 or something like that coz of these players and winning EVEN the e and central these days is almost becoming a dream(let alone qualifying for cup of nations). so rama , wafula and okwemba did not play… WOW! Weakest link in that team as per my observation are Asike, Osiako and Kokoyo. Asike has been blundering all season long at sofapaka, kokoyo is to heavy and is used to high balls at ulinzi, Osiako can’t even complete a pass. Going forward, i feel we miss were and rama. These guys can take on even upto three defenders on their own and bring some creativity. Osborne Monday , Peter pinches opiyo and Eugene asike to gor mahia……macosweto @ 6 you have the potential to be a football scout. This are the same names we have been singing all along, infact all year long., EC the noise is getting louder ……….as for Chris wekesa I am not shocked, he is the most improved gor mahia player in the last 12 months but I think he should have stopped or even avoided the own goal last night ( he scored like striker, this guy was gor mahia’s striker 4 years ago ) , perhaps with time , he will mature and improve on his position play. And offcourse add noah abich , and you can be sure of a continental title next year…………. Reserves: Boniface Oluoch(Tusker),Jactone Odhiambo(Ulinzi),Yusuf Juma(Gor),,David Owino (Gor),Anthony Akumu(Gor),Osborne Monday(Sofapaka),David Otieno(WStima), Paul Were(AFC),Allan Wanga(AFC),George BB Odhiambo(??? ),Enock Agwanda (Sony),Kevin Omondi(Gor),Alloys Mangi(WStima),Amuoka(Ulinzi). jakoyo,maybe the 1st three names you have mentioned but not Abich.In the fullback right position we have 2 good players in Nasio and Musa……in my opinion,Abich today cannot upstage either of them.As for the other 3,maybe they can walk straight into the team,and i say MAYBE because our current players are on top of their game right now! !